The Samsung ST93 is part of the brand's Style (ST) range of compact cameras, with a 2.7-inch LCD screen, 16.1 megapixel CCD image sensor and Samsung wide-angle 5x zoom lens. 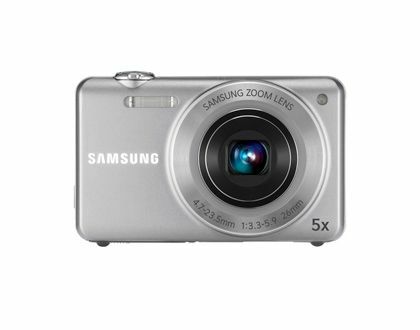 Costing less than the more advanced Samsung EX1 (TL500) from the brand's Performance range, the Samsung ST93's pricepoint puts it alongside rivals such as the Nikon Coolpix S6200, Canon IXUS 230 HS, Canon PowerShot SX150 IS and Samsung's own Samsung MV800. It offers five different shooting modes - Smart Auto, Program, Panorama, Scene and Dual Image Stabilisation - which gives users a wide range of modes to choose from without being too overwhelming. The camera also offers 10 scene options including Magic Frame (where you can take your photo surrounded by a selection of graphics), Beauty Shot, Object Highlight, Night, Sunset and Dawn. Alternatively, you can choose Smart Auto and the camera will pick the best mode for your environment. The Samsung ST93 has the standard five flash options (although some are only available when using certain modes) such as redeye reduction and fill flash. Unsurprisingly at this price point, the Samsung ST93 doesn't offer a manual mode, but the Program shooting mode has quite a few changeable options including white balance, ISO, EV compensation and image quality settings, enabling the user to take photos in a variety of conditions. There are also several filter options available such as Miniature (replicating the popular tilt-shift mode), Retro, Fish-eye, Half Tone Dot and Vignetting. Video can be shot in 720p HD (1280 x 720), VGA (640 x 480) or QVGA (320 x240). There's an impressive amount of options for shooting movies, including setting the frame rate as well as the white balance, EV compensation and metering.